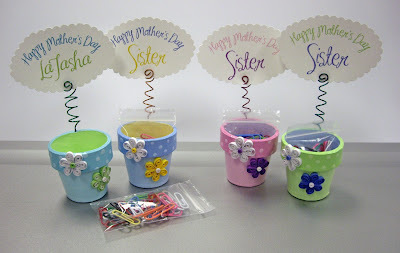 Flower pot paper clip holders with wire holder for notes or photos. Too cute aren't they? These are a revised design from my original flower paper clip holders, I made one just experimenting and my coworker ordered 4 of them for Mother's Day gifts - here they are. They'd also make perfect little thank you's for a coworker/assistant or for a Teacher Appreciation gift - the verses on the oval cards are personalized. These are so cute! Lovely!